VANCOUVER - British Columbia birds outfitted with tiny backpacks have shown researchers that birds of a feather do not always flock together. 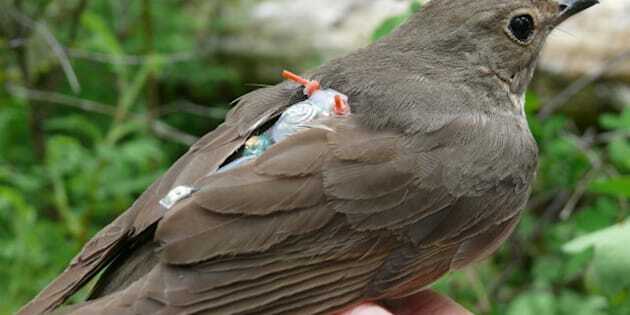 Forty birds from two distinct groups of Swainson's thrushes — one in Pacific Spirit Park in Vancouver and another near the Interior city of Kamloops — were fitted with penny-sized geolocators. The state-of-the-art technology recorded light intensity data just about every day for a year, as the olive-green birds migrated as far south as South America over the winter and returned to British Columbia for the summer of 2011. That information allowed the researchers to determine where the birds went and where they stopped along the way, confirming what has long been suspected. "These two groups are taking very different routes," said Kira Delmore, a zoology PhD student at the University of British Columbia and lead author of the paper published this week in the Proceedings of the Royal Society of London B. The two groups took different routes to different wintering grounds: the Vancouver birds down the coast to Mexico and Central America, and the Kamloops birds across the Rocky Mountains and down the central United States to South America. The backpacks weighed just one gram, compared to the birds' 30 grams, and they didn't disrupt their flight. Return rates of the 40 birds in the study were the same as past years, she said. As they fit each bird individually in June 2010, Delmore and her colleagues learned that a bird in the hand ... is a hard thing to accomplish. "It can be quite a trial," she said. "To fit the backpacks to the birds, we make what they call a leg loop backpack harness, so it just loops around their legs and sits on their backs." Previous research suggests the migration routes are genetically determined, and the results gathered in June 2011 raise the possibility that migratory behaviour plays a role in the process by which one species becomes two. "Given that migratory behaviour is under genetic influence in many species of birds, these results raise the question of what hybrids between these two subspecies would do," Darren Irwin, associate professor of Zoology at UBC and co-author of the paper, said in a statement. "One possibility is that hybrids would take an intermediate route, leading to more difficulties during migration. If so, the migratory differences might be preventing the two forms from blending into one." Although songbirds travel solo at night, in each distinct group the birds stopped at the same sites along the way. "All of the individuals from each one of our populations are actually stopping at the same sites, on migration. For example, all of the birds from Kamloops stopped in Alabama before crossing the Gulf of Mexico," Delmore said. That information will help with conservation. "We know that habitat availability is going down and now we know where the birds really need to stop and where they really need to spend time on migration, so we can focus our conservation efforts on those areas."